The spiritual powerhouse in Ballintubber Abbey is the Blessed Sacrament Chapel, where there is Eucharistic Adoration daily, from 9.30 a.m. to midnight. Families and individuals, mainly from the Ballintubber area, ensure that there is a continual presence before the Blessed Sacrament, each one having their hour each week to ‘look after’. 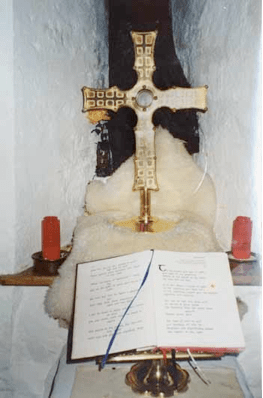 The Eucharistic Adoration has been a feature of the Ballintubber Abbey experience since 1989. It is in an ideal location, set quietly in what was the original sacristy, a quiet, peaceful room, with the original corbelled stone roof perfectly intact. Exposition commences each day after Mass and the Rosary and other prayers recited by the Mass goers for the intentions of the parish and indeed the whole world. A true powerhouse of grace and prayer.